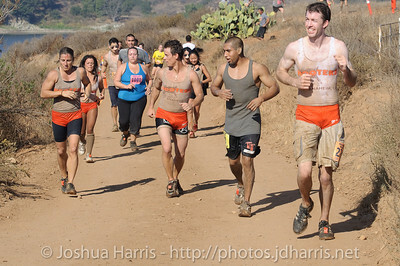 The run itself was fun to watch as well because the way it was all setup was, well, with a lot of mud. Right from the start of the race, they have a guy with a big water truck that starts hosing down all the people as they run. 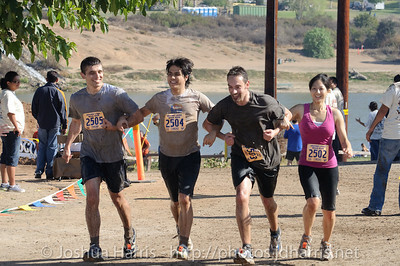 After that it’s a run along a dirt course going around part of Irvine Lake. Place periodically along the run they have place obstacles and mud pits that people have to get over, around or through. By the end of the race, everybody had a bit of mud on them, though some people took it to the next level and had mud ball fights. There were a lot of people that were literally caked in mud from head to toe. 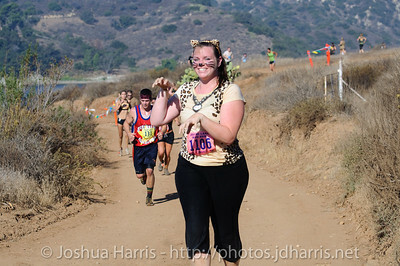 I had myself strategically placed along the course in order to get my friends while they were running. I guess people noticed the camera equipment that I was holding because a lot of people thought I was a pro photographer (lol) at the event and were posing for me and asking me to take pictures of groups. It was a lot of fun. I even ran across a team from my old kickboxing/muay thai studio, OC Kickboxing, while they were doing their run. After the run they had a little Oktoberfest thing going on where they were serving a lot of food, beer and had a couple of live bands performing for the people. I didn’t stay for this part of the run, but I really like the concept! I may have to participate next year if I’m not taking pictures. Overall it was a good day for something like this. The weather was in the mid 70’s, the sun was out and everybody was in good spirits. It was a lot of fun and definitely something I’d be interested in doing again next year!